Your Digital File Claims “The World’s Most Secure” Cloud-Based Storage - Tinaciouslee! Storing confidential files via cloud-based storage just got a whole more secure! YourDigitalFile.com, a Brisbane-based firm, claims to have the most secure cloud-based storage and document trading system in the world. Jamie Wilson, a Brisbane accountant, who created Your Digital File – spent more than three years developing the system. Wilson, who claims that his system offers “impenetrable online storage”’ was compelled to build a secure storage system following the sudden death of his father. He had trouble locating and gathering all of his late father’s documents. This led Wilson on a journey towards developing what would become the world’s most secure cloud-based storage system, teaming up with some of prominent security experts to develop his own storage structure. The system, which can be accessed at www.yourdigitalfile.com, features the company’s super secure Cryptoloc™ encryption algorithms. In order to access their files, users will require more than just a password to get through the system. Any data or file saved from the Your Digital File will be encrypted automatically so they cannot be accessed without using a password-protected digital private key. The digital private key is generated and saved to a client’s computer as soon as they sign up for the service. When used, the private key unlocks and decrypts the encrypted files. The system also offers a nifty feature that helps recover any files if the security key is lost. The technology behind the advanced Cryptoloc encryption algorithms has an international patent application. In a statement, Wilson believes that the Your Digital File’s advanced encryption security will provide “new options for industries such as banking, insurance, telecommunications and financial planning – virtually any industry that needs to store documents securely, confidentially and with complete audit trails.”. 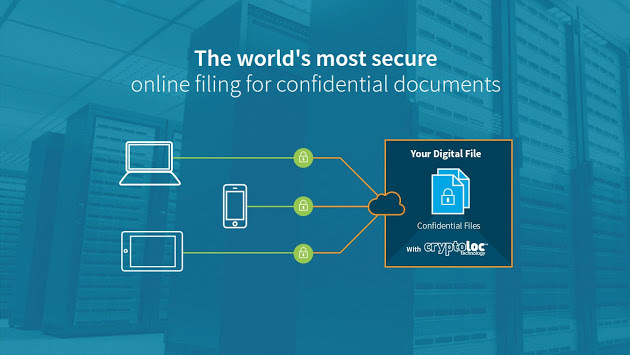 This means that all Your Data Files users can store confidential documents without fear of being accessed by unauthorized parties, not even the YourDigitalFile.com team. Wilson also claimed that Your Digital File would provide a new storage option for Bitcoins, sharing the company’s openness for assisting telecommunications firms when dealing with any amendments to the Australian privacy laws. Even better, Wilson claims that the Cryptoloc encryption algorithms is in strict compliance with the Australian Government’s Signals Directorate standards for cryptographic algorithms and protocols and the legal requirements for valid electronic signatures. The newest storage system with the newfangled Cryptoloc™ encryption algorithms is currently in beta phase and is slated for a full launch early this year.